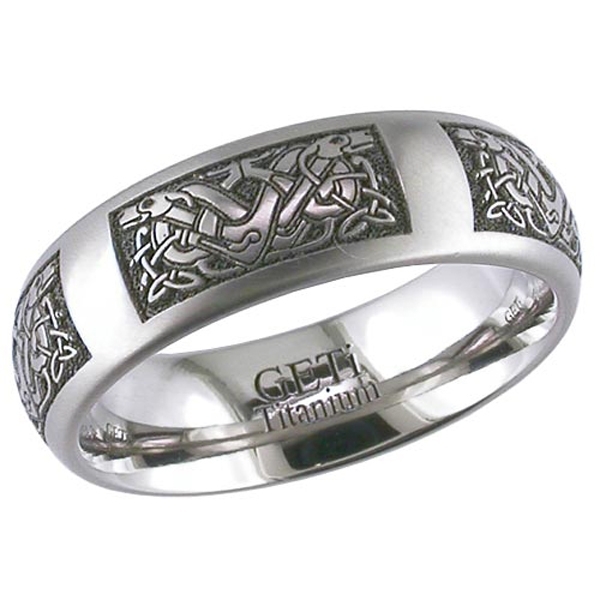 Titanium wedding ring with laser engraved Celtic animal artwork (2 dogs facing away from each other in this instance). The design is repeated 5 times where possible but on smaller finger sizes it may be less. The width of band is 6mm and this ring can also be engraved on the inside. Don't Forget every item we sell carries a 30 day Moneyback Guarantee if you are not completely satisfied and delivery in the UK is FREE and comes in a velvetine pouch you can also choose to have it in its own real wood presentation box.